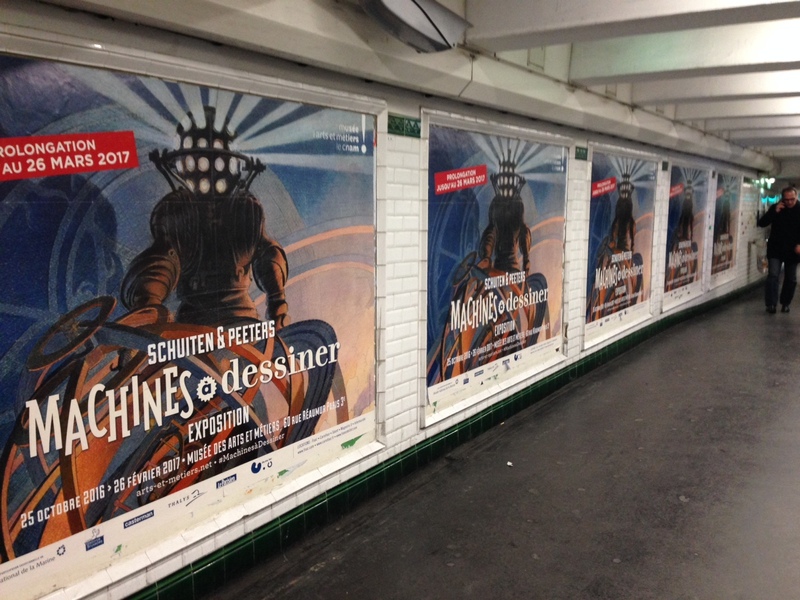 Early 2017 the exhibitions Voyage dans les Cités Obscures and Dialogues - Schuiten / Durieux ended. The exhibition Machines à dessiner in museum Arts et Métiers was extended to March 2017. François Schuiten was invited at “Les Mardis de l'Espace des sciences” to talk about the railways on April 5, 2017. From March to June 2017 museum La Boverie organized the exhibition Révolution bande dessinée. 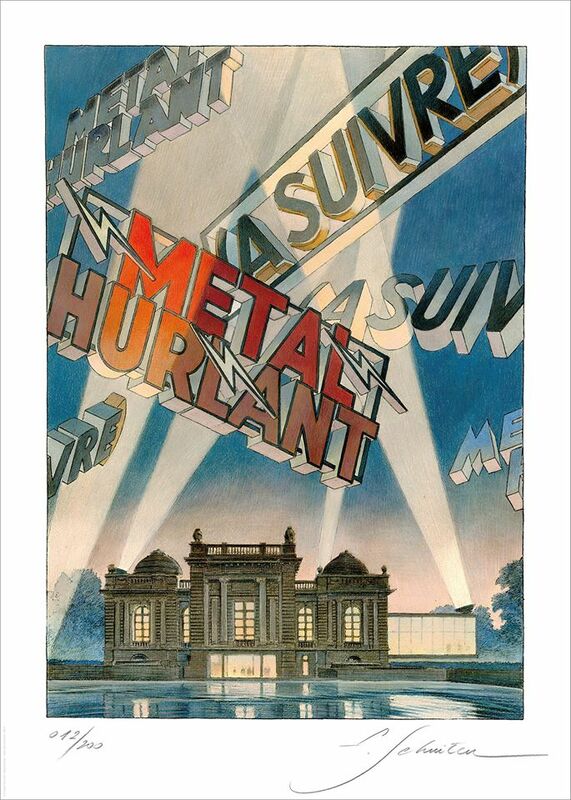 Schuiten and Peeters gave some background commentaries for this exhibiton. François Schuiten also made the announcement poster. 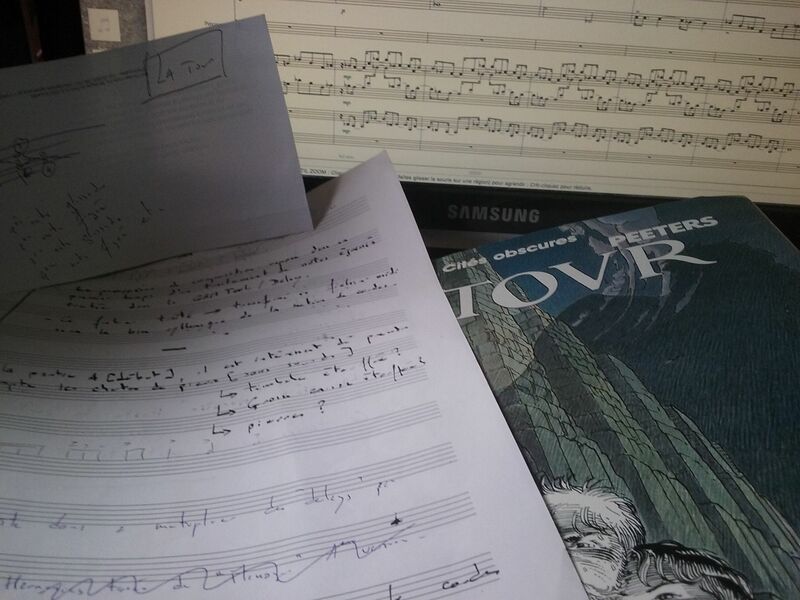 François Schuiten spend most of his time in 2017 working on the tribute album of Blake and Mortimer. The scenario is made by Jaco Van Dormael and Thomas Gunzig. 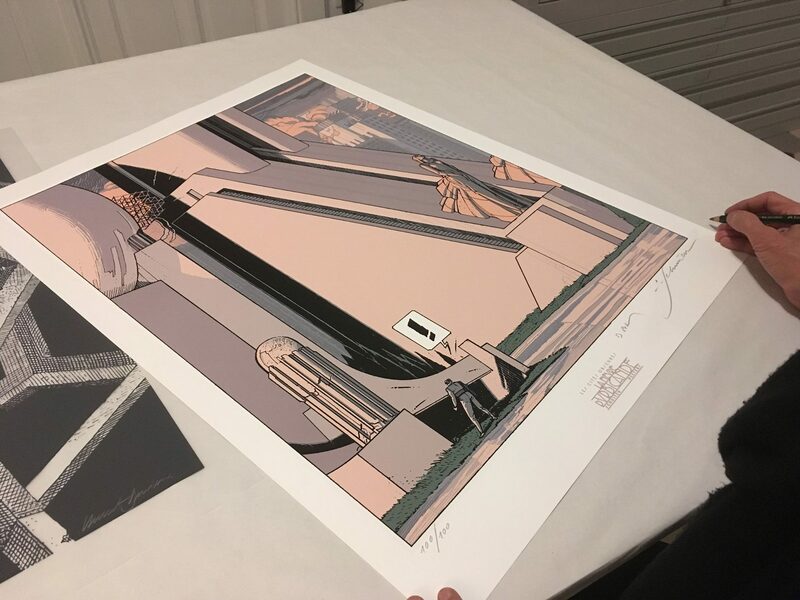 The colouring will be done by Laurent Durieux. On June 15, 2017 the king and queen of Belgium invited 10 personalities of the cultural world for a working lunch. François Schuiten was one of the invitees 2). 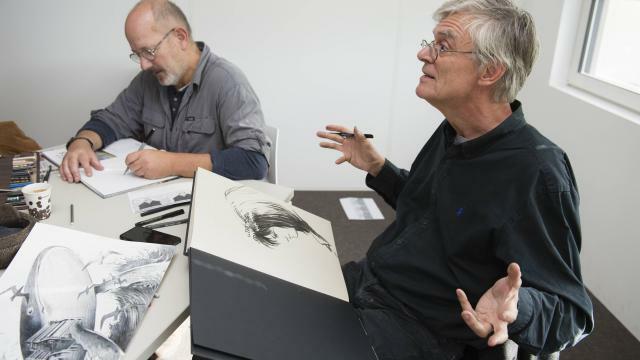 François Schuiten and Benoît Peeters worked again together on another exhibition in 2017. The Biennale du 9e art was held from 23 June until October 1st, 2017 in Musée Thomas Henry in Cherbourg-en-Corentin. The biennale was dedicated to the work of Winsor McCay, the father of the American comics. François Schuiten was nominated for the 2017 Eisner Awards in San Diego. Schuiten was nominated as best penciller/inker for the album The Theory of the Grain of Sand. François Schuiten and Benoît Peeters were invited at the Russian comicfestival Boomfest in Saint Petersburg on September 22, 2017. Benoît Peeters visited Tokyo for a few days in October 2017. Peeters attended a symposium on Paul Valéry and the evening around Jacques Derrida, both organised by the Franco-Japanese house. Fibda10, the International Festival of the comic strip of Algiers celebrated this year its ten years anniversary. The festival was held from October 3 - 7, 2017. 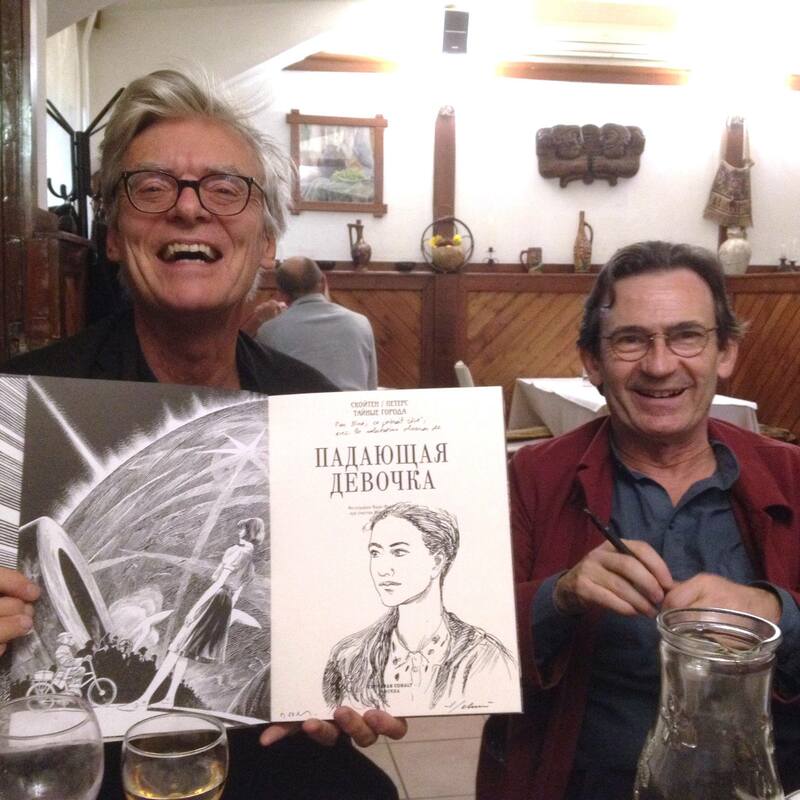 François Schuiten was invited for the festival, he made some drawings together with other artists. Later in October the first volume of Aquarica was released. Benoît Sokal and François Schuiten worked together on this album. To celebrate the release they made together several images for Ouest France. Schuiten and Benoît Sokal were on October 17, 2017 in comicshop Brüsel in Brussels to sign their new album Aquarica. They were joined by their old teacher of Saint Luc: Claude Renard. Benoît Peeters started in September a series of lectures about comic books in the Arts et Métiers museum. Peeters did also the concert-show Paul Valéry. Une voix qui touche aux larmes, based on texts by Paul Valéry and Benoît Peeters on November 16, 2017 at Centre Wallonie-Bruxelles in Paris. Several albums of Les Cités Obscures were translated in foreign languages during 2017, Brüsel and La Route d'Armilia were translated in Spanish. L'Enfant Penchée saw a translation in Spanish, German and Russian. And Les Murailles de Samaris was publised in English. Casterman published in December 2017 the first book with the integral publication of all Obscure Cities stories until today. Comicshop Brüsel made a special edition of this book. François Schuiten and Benoît Peeters signed a special page that was added exclusively to this edition. On December 23, 2017 the radio adaption of La Tour was recorded in Studio 104 of Radio France. The adaption was made by Bruno Letort and Benoît Peeters. The adaption will be broadcasted in February 2018. 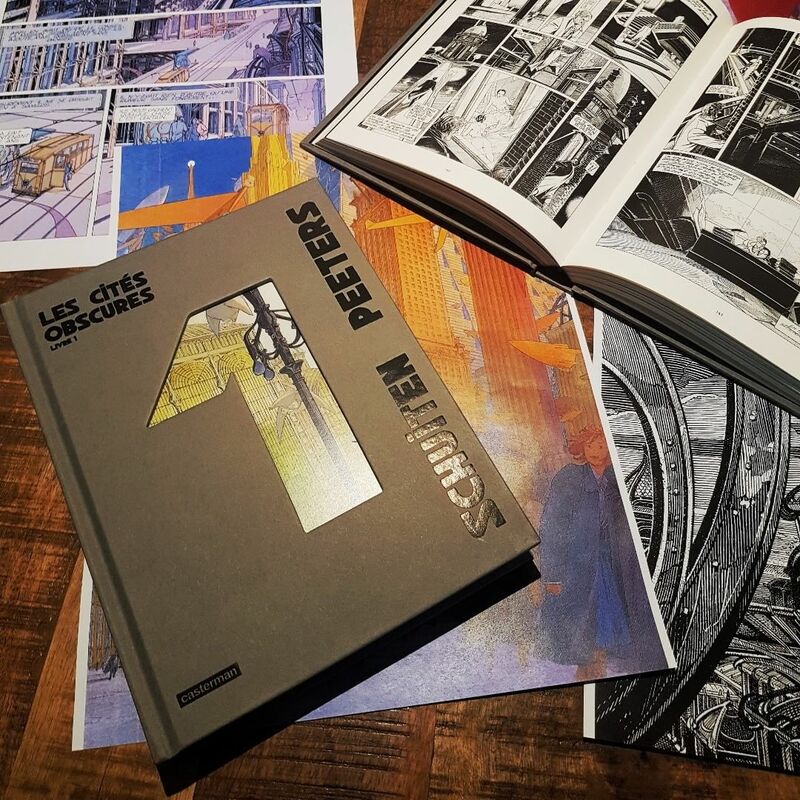 François Schuiten: "Il va falloir repenser cet égout à voitures qu'est la ville"
Benoit Peeters: "Las grandes ciudades corren el peligro de convertirse en museos para ricos"
Schuiten at opening exposition "Le Réseau Madou"